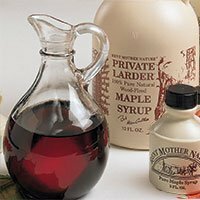 Buy wood-fired maple syrup that is 100% pure & natural. Fill your pantry with Rent Mother Nature’s real old-fashioned maple syrup. Our Grade A, Medium Amber maple syrup is made the old-fashioned way over blazing wood fires! Thicker and richer than USDA requirements, this syrup is 100% pure & natural -superb quality & good solid value. Order yours today!